it's supposed to rain all of next week. so sad, now i can't go running outdoors anymore. but seriously though, i hate the rain. the LA girl in me can't figure out how to deal with rain and the cold up here. but i guess i have to be unselfish here and say that california needs rain, so i guess we can let this rain thing happen. also, we're about to lose an hour. i sound like a negative nancy, but then i'm actually excited about this one because it means more daylight in the morning for me to take photos of baked goods before work!! it's the little things. this little cake is also one of those little things. 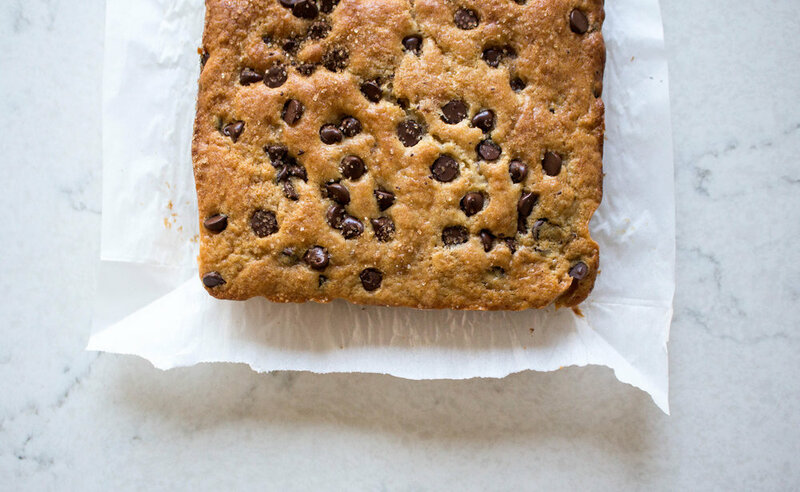 this chocolate chip snack cake is made in an 8x8 pan (again, adjustable), is sweet, fluffy, and studded (what a word to describe pastries, huh) with chocolate chips. 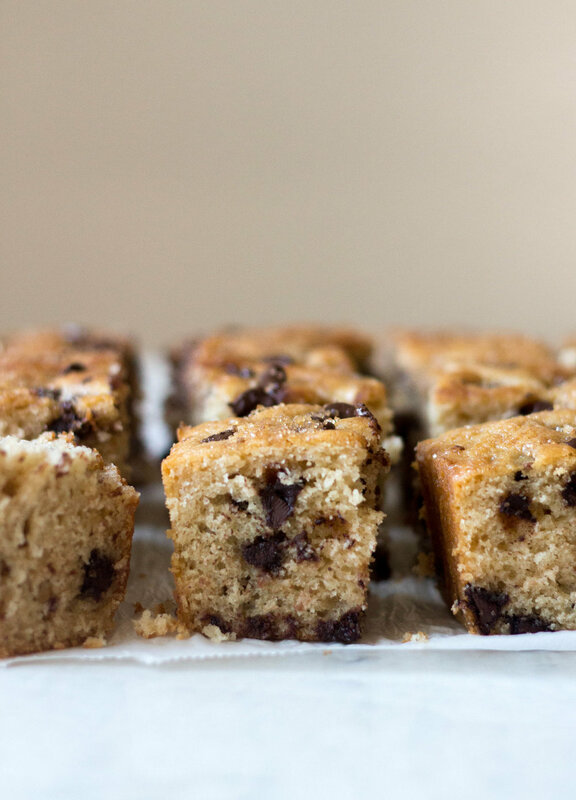 it's like a chocolate chip coffee cake, without the crumble and with raw turbinado sugar instead, for the crunch. take the word "snack" in snack cake for what you will, but for me it's also a breakfast, lunch, dinner, and dessert cake 🤷‍♀️. baker's notes: nothing much this time, except you can bake the cake in a smaller or larger pan if you'd like. just adjust the baking times as needed. preheat the oven to 350 f. grease an 8x8-inch baking pan. in a large bowl, cream together butter and sugars until light and fluffy. beat in the eggs, one at a time. once both eggs have been added, beat on high (if you're using an electric mixer, otherwise, use all your might) until fluffy. stir in the vanilla. in a small bowl, whisk together flour, baking soda, baking powder, cinnamon, and salt. add in half of the flour mixture to the butter/sugar mixture, and mix until just combined. add in half of the sour cream, and mix until combined. add the other half of the flour mixture, then the rest of the sour cream, and mix until just combined. don't over-mix! fold in 3/4 cup of the chocolate chips. pour the batter into the prepared cake pan, and sprinkle the remaining 1/4 cup over the batter. if using, sprinkle some of the raw sugar over the batter and chocolate chips. i really enjoy the crunch it adds! bake for 30-40 minutes, or until a toothpick inserted in the center of the cake comes out batter-free. cool slightly before cutting into squares and serving! enjoy!